While the final bell on Friday may have meant the start of a weekend binge-watching session or video game tournament, it meant the start of the annual Chezy Champs Robotics tournament hosted by Bellarmine. Teenagers from robotics teams in California, the Pacific Northwest, and Houston convened to see who would be crowned the best in the west. Chezy Champs is an annual off-season FIRST Robotics Competition (FRC) competition hosted by Bellarmine’s Team 254. Teams often attend such off-season events to prepare for the upcoming season or just to have fun. This year, about forty robots competed in Chezy Champs, and Team 254 was a semifinalist along with Team 973 The Greybots, Team 5924 The Cat Machine, and Team 696 The Circuit Breakers. Team 254 cruised through the qualification rounds and earned the 3rd seed due to a couple unfortunate mistakes. 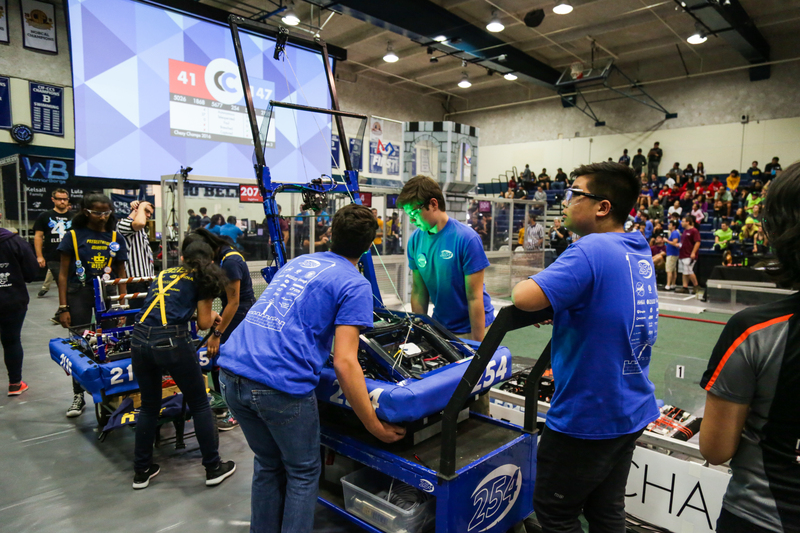 However, some teeth on their drive gears were sheared off, and they were forced to sit out the tiebreaker match in the semifinals; subsequently, their alliance lost in three matches to a formidable opponent. Through the tournament, new students were not only able to ask questions but also to take charge and lead the maintenance, leading to their growth. Final result aside, this event gave prospective members an opportunity to work with the robot and gain valuable experience. Potential members were able to take on extended roles in the competition and get a glimpse of an FRC tournament. Students were able to expand their knowledge and share their passion for robotics, and start off the year with a bang!